I’m not big on watching the so-called “House Flipping” television shows. Why? Because they’re goofy. And downright dangerous. It’s like learning to perform surgery by watching Grey’s Anatomy. Not good. While channel surfing a couple of weeks ago, I ran across a show called Flipping Vegas. It’s about house flipping and, since I moved to Las Vegas recently, I decided to watch it. Where others saw disaster, I saw opportunity. My real estate agents scour the city for incredible deals. Right at the start of this episode, he announces proudly that he’s made a $225,000 ALL CASH offer on a house in a Guard-Gated Community, sight unseen. He plans to fix it up and get a quick profit by (what else?) flipping the house. Apparently, his agent didn’t have to scour too far to find this lollapalooza of a deal. In fact, she didn’t even have to go look at the house in person before she tendered Mr. Investor’s all-cash offer to the bank. Sight unseen by either the investor or the agent. How bad can it be? You gotta be kidding me. Now the agent opens the front door, and we can see immediately that it’s a total disaster – all the walls are gone, the ceilings are gone, and we haven’t even seen the kitchen or the upstairs yet. Then the agent looks at a brochure and says, “All the pictures look perfect.” Honest. She really said this. So she bought this property for her client based upon the pictures. You gotta be kidding me. Woot. A Sixty-Thousand-Dollar Profit! Oops. They forgot to add in the $18,000 Agents’ Commission. Oh well, minor detail. Next we find out the flooding went six inches high up the wall studs on the bottom floor, and up the stairs we go to find the source of the flood – a bathroom. Whether someone intentionally left the water running or what, we never find out. But it is the source of Black Mold, which is a super-hazard. The bathroom has to be gutted and treated, and most of the kitchen (including all the cabinets) has to be gutted and treated for black mold. It’s a true mess. They replaced 24,000 square feet of drywall, they had to gut the bathroom and the kitchen, pay a hazard squad to remove and treat the mold-infested drywall, cabinets, and flooring. So I find it hard to believe that with the extensive damage and serious hazardous mold problem the rehab cost only $45,000 for this 3,900+ square foot house. Miraculously, at the end of program they claim a profit. With smoke and mirrors, they claim the “added value” of $6,000 for the bathroom that had to be gutted and “added value” of $12,000 for the new kitchen. HUH? They had to gut the kitchen and bathroom to get rid of all the hazardous mold. How the heck does this become “added value”? So now the new and improved asking price is: $349,000. Oh, and with all this “added value” (Hey, look folks, here’s a house that has both a kitchen and a bathroom!) they now claim they got not one, but two full-price offers for the new and improved asking price of $349,000. And that’s a profit of $79,900. Really! Internet discussions about the Flipping Vegas: Flood House episode show the property address and say this house actually sold on August 9, 2011 for $275,000. How do the numbers really add up? 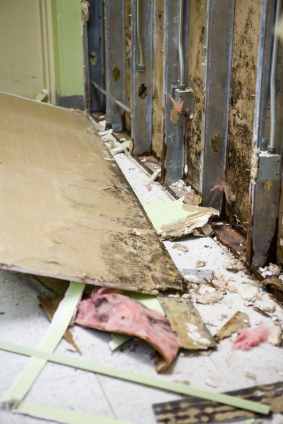 If you’d like to see what black mold looks like and why you should never take advice from these “house flipping” reality shows, you can watch this episode of Flipping Vegas online: Flood House. Your article is so dead-on. It is now almost 2016 and I am watching the second episode of a new Tv show on HGTV called “Flipping Virgins”. It is so irresponsible I feel to broadcast this show. After the first show, which I felt was completely a train wreck and so unrealistic….I decided to see if the second episode would be better. So here it is…a couple who claim they both quit their jobs to become full time house flippers. They have never flipped before and they are pouring their “entire savings” and the sold their own house for a grand total of $60,000! Yes that is right…not $600,000……just $60,000! And this show is supporting this kind of irrational and irresponsible behavior! I can’t believe how unrealistic people can be! I haven’t even watched the whole show, but I can imagine it will end with a “happy ending” which clearly won’t be reality. This couple needs to get a reality check in terms of real income…how are they paying for food, housing, gas, health care? I just don’t get it! Yeah, it would be a dream for most people to quit their jobs and flip houses…but completely unrealistic for most people. Scott is unpleasant to watch.. The drama is over the top. All the scripted scenes on the show makes me comment the entire hour negatively. My wife likes it and tells me I have to be quiet if I want to be in the room with her. I’m happy I’m not the only one that can’t this Scott guy ! Awesome Blog!!! I’m an Assoicate Broker, REALTOR in the Lutherville Timonium, MD area. I wish every Investor and every real estate buyer out there today could read this article. Now these facts are worth the media mentioning in the news. Does the truth ever make the news? I just finished attending a Rich Dad Education “Guide To Real Estate Investing” Seminar. Yes they got me for a $199 but, hey…at least I got to take someone along for FREE. We suffered through an entire weekend of FLUFF (that’s putting it mildly). For some reason I felt I just had to attend to at least hear what they had to offer. Of course I knew in the end right upfront to expect the urgent must do sales pitch if one wants to move forward in Real Estate Investing. My suggestion: READ the “how-to articles” in this Blog! Whoa! I.m in a program for buying by pictures low end stuff AND ON IT GOES. Agree with the article. The show has to create a wow factor to get folks to watch which is why they would pick a house like this. On a side note, making an offer sight unseen is different than closing escrow sight unseen. I’ve done the former based on the MLS pictures but our standard contract has an inspection clause which allows me an out. No investor in their right mind would close sight unseen. But again, that makes the show more exciting (although I’m quite sure it didn’t actually happen that way). Appreciate the feedback, Dave. Most of the people who watch these shows don’t know anything about investing in real estate, which is really why I take issue with the stuff they’re showing. Newbies need to know this is *not* they way to do it, right? I like a lot of those shows and they are one of the reasons that I got interested in investing in fix and flip real estate. However I always watched them taking it all with a gain of salt. The one I liked the most was Property Ladder because they had like half the people on it totally bomb by overestimating the sale price, going well over the timeframe they had, and going way over budget for the rehab. I’m sure that there was still a lot of stuff done just for TV but at least they didn’t pretend like every deal was a walk off home run. Glad you enjoyed the article! If your bid is “binding” like it was at the S&L Loan Crisis auctions and in other situations, where it costs you significant money to cancel your bid, it’s not a good idea to bid site unseen. I attended a lot of those S&L auctions, bought a lot of stuff, and saw too many would-be investors bidding based on the photos in the brochure. I heard two guys agree to bid X amount on a particular house that “looked” good. I had been inside the house and knew the whole thing was fire-gutted. So, more often than not, I do not think “sight unseen” is a good idea. Frankly I think that’s aobsleutly good stuff. Have to say, though, that I have bought 10 properties sight-unseen in the past 2 years. Nope, never had anyone look at them until after closing. It’s not for the faint-of-heart and I don’t recommend it. But I don’t regret it. I lived out of state, knew the area, bought for location and paid 10k or less for each. And I knew that the prices were low because of mortgage fraud in that particular neighborhood and the banks just wanting to wash their hands of them. My thoughts exactly! Except you were too kind in your assessment of the Vegas Show wow I really have never seen such an obviuosly misleading and staged “reality” show. All the Flipping shows are bogus but this one is really really bad. Wait till you see the one with the twin brothers he partners with. You may lose your lunch. We have been doing deals here in Richmond Va for many years and at least I do get a laugh at these shows but at the same time feel bad for newbies that watch this stuff and then jump in and lose their backsides thinking they are going to get rich quick! Been following you since you started Creonline and have learned much from your website and really appreciate the information you put out there for us! Yes, I saw the twin brothers episode. Whaaaat??? listed by the appraisor or property inspector. The one thing that really is “realistic” is what I call the Lt. Columbo Factor; one more thing. Even the best rehabbers miss something or open up a wall and find another problem. Good rehabers have a contingency budget. Another thing that is true is that wonderful feeling you get when you rework the space. Opening up walls, moving them, eliminating wasted space hallways, etc., and making a finished product that works in this market. I truely love these shows but not as educational. I shudder to think what would happen if you tried to learn from them. Or you could watch a sit-com. Better yet, shut the idiot box off and go do another Fix & Flip. Just make sure to do ALL the math. I agree completely. I watched some of that new one with the guy from survivor “Flipped Out” last night, and it was so rediculous I couldn’t watch anymore. These guys didn’t get an inspection, had to replace sewege lines for hundreds of feet, didnt call an exterminator dispite finding rats, they got mad and hammered a granite countertop into a hundred pieces (in the name of good tv) and yet spent next to nothing and made $38,000 on a house that would have a hard time selling in most markets. Its just reality television stretching into another realm for a couple months. Hi Enjoyed this read. I wish I would have found it before watching “Flip this House” in 05 and 06 and then in 07 I started on an endeavor which left me broke. Because it looked so easy. One thing after another went wrong, in fact I believe that everything that could go wrong did. And several professional people were happy to take my money along the way. I’ve been investing since 1998 and have many nightmare stories. I do like these shows for product ideas, different areas of the country have different products not sold here. (New Mexico). One good show is Rehab Addict. It’s the tale of a single mom real estate agent in Minnesota and she’s rehabbing a large fixer she bought. The problems she has are realistic day to day things and her way of working with it. Her project takes almost 2 years! And she’s doing a lot of the grunt work herself in the evenings. What it takes, is hard work, blood, sweat and many tears. And perseverance and tons of patience. The biggest money is to get your own reality show tracking all your moves for one season. If I came to a job as a professional, and The Owner spoke to me the way “Scott” does. I would do one of two things 1 – knock him out in the place while he didn’t ever finish his sentence. 2 walk off of the job because respect, and work ethic is so important. As he hires unqualified contractors who don’t know a piece of drywall from a 2×4! Speaking English is also important, and it gives us skilled workers a bad rap. He is a cheap greedy, and knows nothing about being a project manager except yelling about an unrealistic schedule. Why doesn’t he give himself another week to finish the work — without the angst and trauma? Oh, wait, then there would not be the drama for television. Great stuff, irony here is that the “flipping vegas” is a road show now here in Canada, and as many of you may or may not know, our rules and regulations are MUCH different here, and we tend to see the may companies coming up here, flogging their wares without any idea that 92.75% of it can’t apply here. We don’t have things like “tax deeds”, our tax base is very different here and it is very difficult to find properties that are not already “pocket listings” with realtors. Even drug re-habs go for list -15% WITHOUT being fixed up. So, I agree with many comments, it’s not for everyone and it’s not for the faint of heart. I recently saw the show mentioned above. I also discovered this program while “flipping” channels. If you’ve seen one, you’ve seen them all. My main interest is seeing what is done with the properties. But there is a content to this program that is tiresome and disturbing. First you have “Scott,” who comes accross as a self-indulgent, mean-spirited, greedy “fay” man who goes out of his way to prove how “butch” he is by being abrasive. He keeps doing the same things, buying properties for what he thinks is a “bargain” sight unseen, then discovers that they are in serious need of fixing up. He gets angry. He underestimates the repair costs everytime and complains when the costs run over what he thinks they should be. He should know after a few times what to expect. But if you see two or three of these shows, you know what to expect. Then he has his wife, “Amy” who constantly toutes the fact that she is “one of the best designers in the business.” There are better, but don’t tell her that. Of course her ideas are beyond what Scott has in mind, and she always goes beyond what Scott plans and over spends. It’s one thing to be sure of your business, but it’s another to be so hard-headed and rigid in one’s thinking as she is. While many of her concepts look great, one can only wonder how long they will hold up over time as trends change. Then there is the area of the work and the workmanship. One of the other negative things about this show is that it shows Mexican laboroers in a bad light. There was even a remark made to one of the contractors, “Where did you get these guys, in front of Home Depot?” This speaks volumes about the type of people they engage and the attitudes in general about Scott and Amy. They hire cheap and then complain because the workmanship is shoddy while they continue to rush the job because they did not allow enough time to complete everything in a reasonable period. This is one of the reasons why their labor costs are driven up, which reduces their profit margin. And in the area of workmanship, one can only wonder just how long the work will stand up before the flaws due to the rushed job start to show. This sort of temporary costemic conversion for the sake of the sale seems unethical especially if the buyer ends up having to make repairs on things that were done in haste and not done properly. This is especially a serious matter with homes selling at this price range, most exceeding $100,000. My husband started watching this show and have seen episodes (old & new) of this show for the last several weeks and I totally agree with you!! I was going to comment but your opinion is SO well written. Also, it seems like Scott and Amy’s swearing has increased, do not understand why Scott talks (yells) to the laborers – obviously, some of them just workers and I have a real problem when he refers to the less expensive houses as “double-wides”. Where does he think a lot of people live? Not everyone watching the show live in expensive home. Most of his real agents are slutty looking – not professionally dresses at all but then neither are Scott and Amy. I do not watch many reality shows but this one bad!!!! Scott and Amy do not communicate but yell. Again, just a show and a lot of “show offing” put into it but you just want to slap them both and say get your game plan put together before you rehab. As a wife, I would not put up with the way Scott talks to Amy for television – disgusting but maybe they do not care if making $$ from the shows. As an experienced flipper I hate these shows, they are not reality, their rehab costs are way undervalued, when they are finished they have a mob of buyers wanting to purchase, yeah right, lol.. None of these guys do any research before they spend thousands on a piece of property site unsee before they purchase, yeah right, lol.. The numbers in the show are totally fake. On a recent show, I added up te costs of a few items -flooring, handrail, cabinets and countrs, and the total was way more what they said their total costs were. I didm’t even include the labor costs! I watched a show and they rehabed the kitchen and bath and replaced the drywall. decided the roof needed repaired. You would think that someone would have looked at the roof before they started the repaires. I love these type shows but I just can’t deal with Scott. He may be the most obnoxious person I have ever seen. I HATE Flipping Vegas, Scott is the most classless pos and I would never buy a house he had anything to do with. Amy does have some good design ideas but she needs to dump Scott and find a real man and not a petulant man boy. Armando on Flipping San Antonio is just a slum lord low life. Again I would never even look at house he touched. Both shows exploit and abuse Their workers, it’s quite disgusting. These shows are all fake so you should not believe anything you see on any of them. Flipping us a dirty expensive business. You have to build a quality reputation and be a quality person to really make a career out of it. I think they forget about a lot of stuff. Capital Gains taxes for one. I know you have to live in the house and it be your prime residence for at least two years for you to NOT pay taxes on the flip… so guessing they forgot that too. capital gains (I’m exempt thank God) but some may not be. I think people just think I’ll sell my home for X and buy for X and that’s it. You really need to look at ALL of it. Including if you move further out like we want to. That’s twice the distance and twice the gas and wear and tear on the car as well and more insurance on the car (they give us a discount on insurance because we don’t drive far but it changes the more you do). Now considering all that and our age? I am now contemplating staying as my house is paid off. If I want to escape, I’ll take a vacation! Can’t watch the house flipping shows. I’ve been in this business too long (since the ’70’s). They might be entertaining, but the educational value is zero. I remodeled many homes and if you think a project is going to cost, say $100.00, bet your hammer it’s going to $200.00. You NEVER know what is behind that wall and believe me it’s never what you think. There are so many foreclosures you can have your pick AND you can go in and look the property pretty good before you buy. A lot of “hoods”, no matter what you price thee house, you “ain’t” going to get your money back. Also you may need a guard at night till the house is sold. Add it all up. Tons of fees and hidden costs. So, please set your guidelines and stick to them. Also, learn how to properly estimate and NEVER purchase a home without seeing it (Why ask for trouble, when it can be avoided)! Thanks for the info Gary. Are you acting as your own GC or do you hire someone? Do you hire your own subs or does the GC if you have one? Is labor added to the $17k average ticket? On top of that, “Mr. Investor” is a total a–hole who is constantly berating his wife (why she stays with him, I have no idea) and openly says that he wants to “renovate” the property as cheaply as he possibly can. I pity the fool who buys a house from him. Great article and I totally agree with you. I am an architect and actively invest in real estate and these flipping shows are very deceptive and misleading and should be taken purely as entertainment value, though with very bad acting and scripted drama — if the drama, which happens repeatedly like clockwork, were to be real than Scott and Amy would have been divorced. The numbers never add up and I don’t know how they could spend so little time and money to rehabilitate a dilapidated house. Also keep in mind that the stars of the show make nice money from the TV networks and they get deep discounts or free goods in exchange for featuring products on their show. So don’t be fooled by quick easy money that Scott and Amy has led you to believe they make on every weekly episode — all their fancy expensive sports cars are leased or on loan, and they now make obscene amounts of money from pushing their real estate seminars on poor naive people across the country (the modern day Tom Vu seminars if you can remember that scam from the 80’s). You will have to be very stupid to buy a house sight unseen, unless it’s just worth the land value or the house is a total gut job or tear down. You are asking for trouble. You also have to do a lot of due diligence before buying a property especially if its an investment property. You have to know its history, the neighborhood and its neighbors, environmental/soil issues, zoning/building restrictions, etc. These things are important but so often overlooked. The saddest thing with these flipping shows is that the average Joe thinks they could spend $30,000 and a couple weeks fixing up an entire house and flip it for big money. What actually happens is that these flips are improperly renovated with lots of corners being cut, mostly to the items that are important to a quality renovation but not seen or appreciate to the naked eye, such as plumbing, electrical, mechanical, insulation/waterproofing, etc. So what you have is trendy finishes and cosmetics hiding shoddy work. I always stay away from flips for these reasons as they are homes fixed up solely for profit and the quality and attention to detail is not there, and worst of all most or sometimes all of the work was done without proper permits which will come to haunt you later on. I live in most of my own “flips,” though they are not really flips as I live long enough to avoid capital gains tax and spend months on the renovations which are done to my own high standards as I am a professional architect & designer. When I sell buyers do appreciate the quality and attention to detail and I get top dollar because of it. Flips that have never been lived in could spell trouble as you never know when problems will surface and home inspections could never reveal every potential issue. Unfortunately, with popularity of HGTV and other networks jumping on the reality home improvement/real estate show band wagon, we will have a national epidemic of people swayed by shiny new appliances and trendy tile jobs and over-paying for these shoddy homes, and also people getting way over their heads in property investment and construction with little to no skills or experience. Didn’t that help cause our last real estate meltdown? It’s TV! It’s entertainment for Pete’s sake! It’s fun to watch. I can’t believe all you pros are getting your knickers in a twist! I think that Scott and Amie are eachother’s beards and it’s a marriage of convenience. I’m pretty sure Amie is bedding down their wholly unprofessional realtors who have got to be strippers or work at the Bunny Ranch or something. There is no way these boobilicious ladies are professional realtors. Professional something maybe but not licensed realtors. I saw one episode where the “realtor” left her top unbuttoned (no bra) and cleavage on full display for men/women/children to see and ogle. The blackmail house” episode is one of my favorites because it exaggerated all the clichés of private detectives. Am I the only one who finds all of the reality shows have one script revised to fit their program? A man and woman, either the hosts or participants, always at odds with each other, lots of drama and screaming at each other, mad dash to finish on time, etc., etc., etc. Whether it is Flipping Las Vegas, Flipping Out, Restaurant Impossible, Project Runway, Top Chef, etc. This morning I turned to Flipping Las Vegas. It is fascinating to see how much the guy screams and belittles her and she schemes and sabotages him. Are they married? Why? I’m from Australia where there is something similar on television but they always disclose all the work, costs at the end of the program, it’s all upfront,, now i have moved to Portugal and i have noticed all these reality programs on the cable channel here in English which is great for me so i like to watch them but i always end up scratching my head when they quote the cost of the work / repairs, the workmanship by the tradesman seem to be ok but i nearly fainted when i’ve seen on various (american) shows, the hosts attempting to knock down a drywall with a sledge hammer, hammering next to a power outlet that was active, it left me speechless. These shows should be taken off air because inexperienced people see these shows and think that it’s so easy, then when they try to do it they embrace a financial disaster, lives ruined, family breakdowns, all because of these shows. I’d also like to point out that the construction industry has the highest death and injury rates of any trade, there is never any mention of safety ever. In Australia there is no flipping houses as in america because there is a tax law called ”capital gains” meaning if you buy a house then sell it right away you are subject to a really huge tax payment to the government, this is reduced after 5 years, so i wonder why all these house flipping programs talk up big profits, low renovation costs but never explain government taxes, do they not exist, i think taxes exist worldwide,,, as these programs are advertised as ”reality” tv programs i think they have a bigger responsibility to the public to disclose more truth than the bickering that goes on and the cowboy building techniques that should be avoided, more sites like yours and more truth should surface to shut these people down, i’m a builder and i know there is no ”reality” in any of these shows. They should be more honest. The real estate training seminars are just as bad. Make it sound so easy. Wow so called this show BS – the rental luxury cars make me laugh . Glad to see others see through this nonsense. Very interesting and informative. Thanks! Thank you for sharing, really great post!